The stories of Comberford Hall and the Comberford family have been intertwined for generations and centuries. 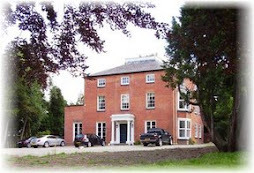 This is the story of a Staffordshire country house, and the family that took its name from Comberford, which lies on the banks of the River Tame between the small cathedral city of Lichfield and the market town of Tamworth. It is the story of a family that produced both Catholic Royalists and ex-Cromwellian Quakers during the English civil war, but it is also the story of an Irish family that sought its roots in Comberford. 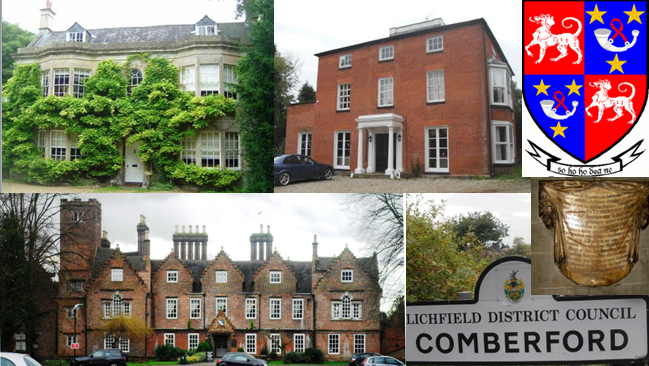 Comberford is in open Staffordshire farmland and countryside in the English Midlands, two or three miles north-west of Tamworth in Staffordshire and four to six miles south-east of Lichfield, west of the A513, within Lichfield District Council. The nearest city, Birmingham, is 14 miles to the south. This is the heart of England, and a nearby point, between Hammerwich and Wall, is the furthest place inland in England, being 56 miles from high-the tide mark, including tidal rivers. 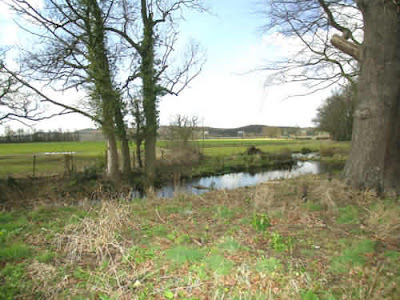 Comberford came into the possession of the family which bears its name soon after the Norman Conquest and continued in the family’s ownership uninterruptedly until after the Civil Wars of 1642-1651. Set on the east bank of the River Tame, Comberford lies off the A513 from Tamworth to Alrewas, almost half-way between Tamworth and Lichfield. According to most authorities, the name is Anglo-Saxon in origin, meaning “the river crossing of the valley.” However, Bardsley says a “Comb” was a cell or hollow in a hillside, where there was a sheltered habitation. The Celtic word cwm means a hollow, while the Anglo-Saxon camb means the crest of a hill. Lichfield was the spiritual capital of Mercia, while Tamworth was the temporal capital of Mercia from the mid-8th century. The history of this area stretches back to Roman times. On the outskirts of present-day Lichfield, the Romano-British village of Letocetum (from the Celtic lwyd goed or “grey wood”) was built at Wall, six miles west of Comberford and three miles south of Lichfield, where Watling Street and Ryknild Street meet. This village was based on a Roman fort next to Watling Street that was used from the first century AD until about AD 160-170, when the fort’s mansio was destroyed by fire; at the same time the forum in Wroxeter was also destroyed by fire. This suggests a revolt of the local British. The history of Lichfield in the following centuries is obscure. According to a popular local legend, 999 Christians were martyred in Lichfield around AD 286-300, during the reign of the Roman Emperor Diocletian, and the name “Lichfield” actually means “field or place of the dead.” The civic seal of Lichfield recalls the story of these martyrs. However, there is no evidence to support this legend, and others argue more convincingly that the first part of the name of Lichfield is derived from the Roman Letocetum and the Celtic lwyd-goed, and the second part from the Old English or Saxon word for a common pasture. The Historia Britonum lists the city as one of the 28 cities of Britain. In the Welsh poem The Elegy of Cynddylan, Caer Lwytcoed or Lichfield is said to have been taken by the sword by pagan opponents, most likely the Mercians to the east. Anglo-Saxon Tamworth dates from around the year 585. The Anglo-Saxon kingdom of Mercia was established with Creoda as its first King. The first authentic notice of Lichfield occurs in Bede’s History, where it is called “Lyccidfelth” and mentioned as the place where Saint Chad fixed the episcopal see of the Mercians in 669 when he was appointed Bishop of Mercia by Archbishop Wulfhere of Canterbury. Around this time, the first record appears of a church in the Tamworth area. Chad died in 672, and his burial site soon became a centre of pilgrimage. The burial in the cathedral of individual kings of Mercia further increased the prestige of Lichfield. In 757, Offa succeeded Aethelbald as King of Mercia after Aethelbald was murdered by Beornred at Seckington, three miles north-east of Tamworth. In 788, at the request of Offa, Pope Adrian I raised Lichfield to the dignity of an archbishopric, although the primacy was restored to Canterbury in the year 803. A charter was issued by King Offa of Mercia in 781 from his royal palace at “Tamworthie.” Offa’s palace may have been a large, thatched, wooden building. Its location is not known: excavations in 1968 indicate it may have been north-east of Bolebridge Street, although other possible locations include the area of the churchyard north of Saint Editha’s Church or in the Castle Grounds near the castle gatehouse. The Danish Vikings looted the area around Tamworth in 874 and 875, and Tamworth was burned to the ground. The following 40 years saw Tamworth lying in no-man’s-land between West Saxon England and the area of Danelaw. When King Aethelred died in 911 or 912 leaving no male heir, his wife Aethelfleda, daughter of Alfred the Great, succeeded as ruler of Mercia. This is the only example of a female ruler in one of the kingdoms throughout the whole Anglo-Saxon period. In 913, she led a military campaign into the area around Tamworth and established a burgh there. 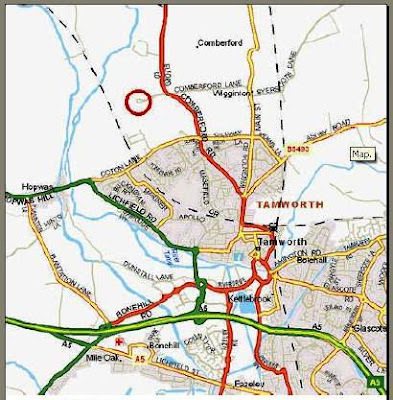 This was a significant gain by the Mercians owing to the strategic importance of Tamworth as Offa’s old capital of Mercia and its proximity to the bishopric at Lichfield. The area of the burgh – approximately 50 acres – was bounded by the rivers Tame and Anker in the south, the present Marmion Street in the east, Albert Road and Hospital Street in the north and Aldergate and Holloway in the west. It was around this time that Tamworth was divided between two adjacent hundreds (Hemlingford Hundred and Offlow Hundred) – the border followed the line of Holloway Street and Silver Street, Church Street and Gungate. This partitioning was to remain until 1889 with Tamworth straddling the county boundaries of Staffordshire and Warwickshire. Aethefleda died at Tamworth in 918 and Aelfwyn succeeded as Lady of Mercia. However, in December 918, King Edward of Wessex came to Tamworth and assumed control over Mercia, depriving Aelfwynn of her authority in the kingdom. Following the death of Edward of Wessex in 924, a great council was held at Tamworth, where Athelstan was named “King of all the English,” effectively uniting Mercia and Wessex. Athelstan died at Gloucester in 939. The Viking Anlaf, son of King Sihtric of Northumbria, struck hard at the heartland of Mercia in 943 and Tamworth was again destroyed. The Viking occupation did not last long and King Edmund reclaimed the lost land. Following the Norman invasion of England, Tamworth came under the control of Robert le Despencer in 1070, and a motte and bailey castle was built in the area of the south-west of the original Saxon burgh. Lichfield appears as Licefelle and Lecefelle in the Domesday Book in 1086, but Tamworth is conspicuously missing. Robert de Marmion inherited Tamworth around the year 1095, and before he died ca 1100 he had established himself at Tamworth on the site of the fort built by Alfred the Great’s daughter, Aethelfleda. The Marmion family was dominant in the life of Tamworth over the next five generations, and Robert’s descendants became involved in later generations in a dispute with the Comberford family involving the ownership of the Manor of Wigginton, one mile east of Comberford. Today, the village of Comberford is part of Wigginton and Alrewas parish within Lichfield District Council. 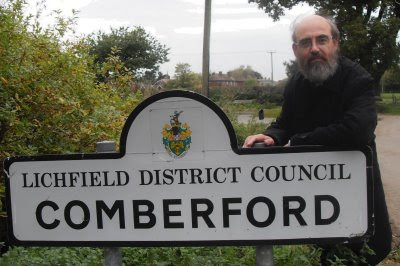 The story of Comberford from the time the Marmion family came into the possession of Tamworth until modern times is a story that is intimately linked with the story of the Comberford family. 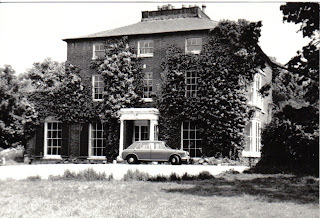 Sir Nikolaus Pevsner, Staffordshire (Harmondsworth: Penguin, 1974), p. 19; The Guardian, 7 August 2007, p. 31. Shaw 1, p. 232; Greenslade, A history of Lichfield … ecclesiastical history, p. 157; Upton, pp 2-6. Henry Wood, Borough by Prescription: a history of the municipality of Tamworth (Tamworth: Tamworth Corporation, 1958), p. 2; Stone, pp 4-6; Upton, pp 8-9. Wood (1958), p. 2; Upton, pp 8-9, 11-14. Wood (1958), p. 3; Stone, pp 6-8. Wood (1958), p. 5; Henry Wood, Medieval Tamworth (Tamworth: Tamworth Corporation, 1972), p. 9; Stone, p. 9. Wood (1958), p. 5; Wood (1972), p. 3; Stone, pp 10-11. Wod (1958), pp 5-7; Stone, pp 10-13. Wood (1958), pp 7-8; Stone, pp 15-17. (c) Patrick Comerford, 2008, 2009, 2010, 2011, 2012. Last updated: 31 October 2008; 27 March 2009, 17 August 2009; 10 August 2010; 27 April 2011; 31 May 2012; 12 June 2012. I am researching Port Royal Jamaica in the late 17th century and the works of art which were made there between 1671 and the earthquake in 1692. One Matthew Comberford was living in Port Royal in 1673, and I am trying to establish whether he was a combmaker, an engraver or a craftsman in tortoiseshell.